This could be my favorite day ever. Race day eve = Lazy day!!!!! And I hear that before the marathon I get to take the entire week off...don't really think that will ever happen?!?!?!?!? I did go run this morning but it was before 9 am so it doesn't count as a run. And it was an incredibly easy run this morning. It was a 5 mile trip but we did not run the entire 5 miles, not by a long shot. Then the rest of the day I had the TENS unit on the knee and did no more workouts. Just sitting at my desk, I only climbed the steps at work once. I am trying something new for tomorrow. 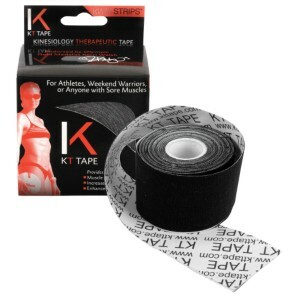 Its called KT Tape. I am absolutely willing to try anything to keep this knee from hurting until I get done with the full marathon, then Doctor time. Anyway, I have high hopes for this stuff. I hope this stuff works because if it doesn't you know I will call it out. If it does work I will have a love affair with it like I have BodyGlide! I'm going to head off to bed....when you have a lazy day there is not much to talk about at the end of the day. I have to get my Zzzz's before tomorrow. Wish me luck! I didn't mean to be anonymous! Biggest Loser, Biggest Disappointment EVER! What an Episode? What a Day!! !